The traditional face lift: This type of face lift involves a surgical cut in your hairline that extends beyond your ears and around the back of them. Without being too graphic, excess fat is taken out or moved around or muscles and tissue are tightened up. Once this is complete, the skin is lifted and pulled back and any excess is removed. The stitches are positioned where the incision took place. Fine drainage tubes will often remain behind the ears so that blood and other fluid can be easily drained away. Once the surgical procedure is complete, bandages are applied and these needs to stay in place until you're allowed to go home. Minimal-access Cranial Surgery (MACS): This type of face lift is less invasive than the traditional face lift as the incisions are smaller and less prominent. Incisions are made at the temple and at the front of the ears so that fat can be taken out and the muscles tightened up. Keyhole surgery: With keyhole surgery, several small cuts are made and the procedure is conducted using a small camera called an endoscope. This is passed through the cuts (along with the surgical equipment) so that the surgeon can see what he or she is doing. In comparison to a traditional face lift, there is less scarring and the healing process takes less time but is mostly reserved for face lifts in the upper part of the face and brow lifts. 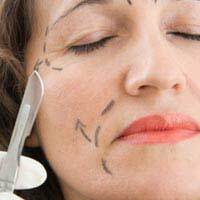 Your surgeon will explain how best you should go about preparing for face lift surgery. If you're a smoker, you'll have to quit in the run-up to speed up the healing process and limit the possibility of developing a chest infection. If you take medication, you may need to stop taking this beforehand. These kind of things should be discussed in your initial consultation. Face lift surgery is carried out under general anaesthetic so you'll be asleep throughout the procedure. As is typical when a general anaesthetic is involved, you can't eat during the six hours (approximately) leading up to the surgery, but occasional sips of water may be allowed until around two hours to go. Once a consent form has been signed to confirm that you understand the risks involved, your face will be examined and photographs may be taken for comparison purposes after the surgery. You'll need to stay in hospital overnight and someone will need to be on hand to take you home when you're discharged and stay with you for twenty-four hours as the effects of the general anaesthetic are likely to still be in your system. Before you're discharged, a nurse should provide advice on how to care for your wounds properly. In the early days, painkillers (but not aspirin) will often be necessary to limit discomfort and some degree of swelling is also par for the course. If you've had dissolvable stitches put in, these should last for between two and three weeks. Otherwise, your stitches will be removed around a week after surgery. Generally speaking, recovering from a face lift takes around two weeks. At this point, you should be ready to go back to work but strenuous activity is not recommended until this point. To speed up the recovery period, you're advised to keep your head as upright as possible in the first few days after face lift surgery to reduce swelling. As with cosmetic surgery in general, there are several risks associated with face lift surgery. These include scarring that takes a long time to heal, a raised hairline around the ears, nerve damage and bleeding under the skin.